Corey Dixon: To this day, I get nervous if I see it again. I haven’t watched it in about 5 years. I get nervous watching that punt return because I know in my head that they called it back. But it’s an unanswerable question of, ‘What if they didn’t?’ and, ‘What if they hadn’t given William Floyd that touchdown?’ It bugs me to this day. I don’t even have the game on DVD. I’d like to get a copy of it. CD: Yeah, I was always looking forward to speedy-type games. 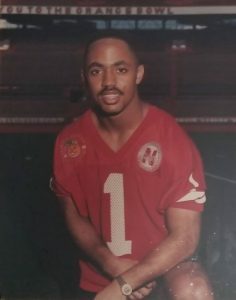 I remember back when ‘Rocket’ Raghib Ismail returned a punt one time and I remember saying, ‘I want to do that one day,’ and that opportunity actually came and it didn’t count. Q: Do people ask you about that play and the phantom clip? CD: Yeah, I always get that question. I still haven’t seen that clip. I was talking to a Florida State fan about a year ago and they said we really won that game. 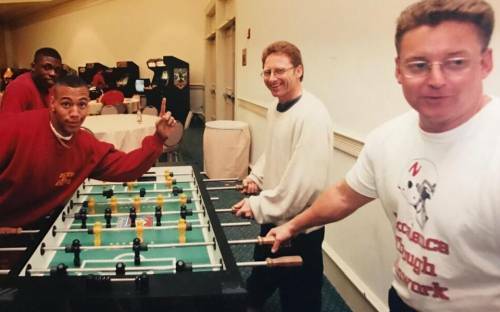 I said, ‘That’s understandable, but we still didn’t get to take home the awards.’ They said that’s always talked about and it’s an unforgettable game and that I always made the Florida State fans nervous when they kicked it off to me. On that last kickoff return I wanted the ball, but they kicked it off to Barron Miles. He grabbed it, but I was calling for it. It was the heat of the moment and I wanted to be the guy to make that play. That runs in my head to this day, ‘What if I would have caught that ball? What could I have made happen?’ You know? Q: Can you recall the one you ran back? What was going through your mind as you crossed the goal line? CD: It was just excitement! The first thing that crossed my mind was my mom. 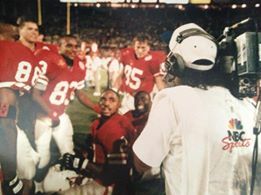 Then all my friends just watching (being excited because we were the underdogs in the national championship game, and how that’s not supposed to happen), and then taking the punt return to the house and seeing that flag out there was a heartbreaker. And they couldn’t find the clip, it was a mystery clip. The other touchdowns that I had in other games were nice, but that was a special one. Q: Speaking of other games, do you have anything more memorable? CD: I think the Colorado game out in Boulder, that touchdown catch against those guys. I had a real exciting game against them returning punts and receiving that game. Also, in Tokyo I had a nice, beautiful catch over there in Japan. But overall, every year against Florida State? Both years I had a decent game against them. Q: Were they the fastest team you’d played? CD: Yeah, they were the fastest: them and Miami. Playing them in the bowl games was tough, with their speed and all, but what motivated you was that you’re the underdog and the world is against you saying you can’t beat them, you know? I remember interviewing with the guys from ESPN, Craig James and Mike Tirico. Craig James would always tease me saying we weren’t even gonna be able to stay on the field with Florida State. I tell you, in the 4th quarter during a TV timeout we were in the huddle and the Florida State defense was just on their knees. I was like ‘Okay, boys, we got these guys. We got them now, they’re tired.’ Just being the underdog motivated me. Then the showing we put out? We couldn’t ask for nothing better than that. I actually have an MVP trophy from the Orange Bowl right now, here in my living room. Q: Do you have a most memorable off-field occurrence? CD: My college career? That experience was fun. If I were talking to any youthful person thinking about going to college today, I’d say, ‘Go to college, because that’s a beautiful time of your life.’ There were so many moments… And becoming a man? Being able to get the degree? And the system they have there and graduating in 4 years? I didn’t go to college even thinking I was gonna be able to graduate. (laughs) But once I get there in the system, in the program, they were like, “You have to graduate.” And once that gets in your system? I guarantee you we had a lot of graduates. And I tell you what, once I got back to Texas and had a chance to share it with other people, I inspired other people to go back to school and get their degree. Walking across that stage was something. I learned a lot and made a lot of friends, and we still talk today. Lincoln was good to me, and they tell me now that it’s even better than what it was. CD: Yeah, I need to take my kids up to see it. The last time my daughters were there was when my youngest was two or three years old. There’s nothing like it, seeing that Sea of Red out there on the field, it was something. Q: Do you ever have the occasion to meet any of the guys to watch the games together in any sports bars? 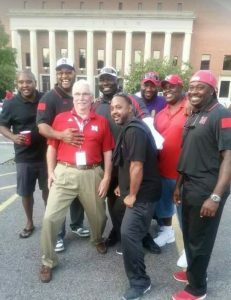 CD: You know, years ago I used to get invited by the Texans for Nebraska group to watch the game. And I would go do autographs and there would be 500-plus in there wearing nothing but red, and it would be just as loud. (laughs) And I thought, ‘Wow, to be in a bar and these people are going crazy about Nebraska?’ It’s something. Q: What was your shining moment? CD: Being on the field that Florida State game, especially playing for the national championship. What game could be bigger in college? That was a great moment for me. And the fans, the kids? There was a foundation where they’d have a wish list and they would want to meet you. And to meet some of those kids that put you on a wish list, you’d never assume that kids would want to do that, you know? I mean, they wanted to meet me?! To meet me! That’s amazing. Of all the people in the world, a sick kid wants to meet me. I think I still have a t-shirt that a kid drew me. It had a picture of me running the ball on the front of this t-shirt. I’ll always remember that being special. Q: Now, from your freshman year to your senior year some changes took place within the team. From your perspective, do you recall anything special happening? 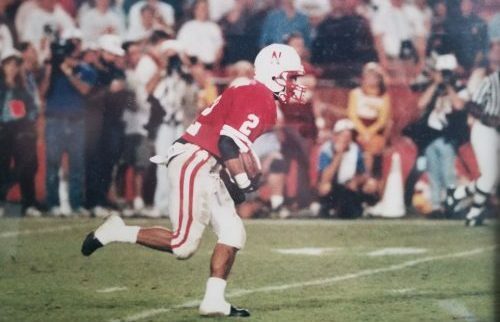 CD: I think the transition from my freshman year, I think what Nebraska had more was power. And from my sophomore year to my junior year, I think we started developing a little more finesse and speed. I think that kind of changed how we approached the game and we started to do a little bit more. And with Tommie starting as a freshman the year before, we were able to make some adjustments. I think the offense and defense started to get a little bit closer, too. And we had an incident over there in Tokyo where the team became one, fighting against some wrestlers. And there were the Blackshirts, but we as an offense wanted to come up with something and we came together and got closer. I think that was our time, that moment. Q: Do you recall the Unity Council? CD: When someone got into trouble we had to bring that issue in front of everybody. I remember when Mike Petko and the rest of the guys my freshman year, they got that together and all. And once we became upperclassmen the younger guys respected us. We had a pretty good mentality. We wouldn’t allow guys to do nothing wrong because we respected Coach Brown a lot, respected T.O. If someone was getting out of line we’d say something about it. We had to represent ourselves and get guys straightened out if they were doing anything that wasn’t proper. Q: Would there be one person behind the scenes who you recall contributing a lot? Someone many fans might not have been aware of? CD: I’m gonna say Bryan Bailey. Bryan was the kind of guy that pushed you to be the best you could be in the weightroom and definitely turned me into a different player as far as my body, my strength. I know it was Boyd Epley’s program, but there was something about Bryan that would make you go out and do something that you normally wouldn’t do, that he pushed you to do. Bryan was strong and he was a small guy, but the way he talked to you and believed in you? It put a lot of things in your head to go out there and be the best you could be. And it’s because he had to get you ready, because in that weightroom it was something serious. Q: So what was it like being in the huddle with Tommie running the show? CD: Tommie had a voice that was so small. He had a real serious voice. 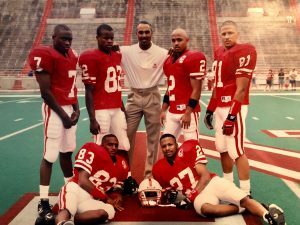 Depending on the situation we were in, we were all serious and focused…and we knew with Tommie handling the guys that anything was possible: if it was a pass play we knew it could turn into a running play, so we never knew what was going to happen. So when we’d leave the huddle we just made sure to do exactly what we were supposed to do: we were trying to get the ball into the end zone. We were serious about it. Q: What about the mottos? CD: I remember, “A team that can’t be beat, won’t be beat.” I had it printed up. I was trying to share it with my kids the other day. That was part of the team prayer. Vernon Powell brought that to the team. He used to say it every game. He learned it from high school and brought it to Lincoln. Q: Any recollections of pregame speeches standing out? CD: Every game required a different speech. We were going off of how we felt that game, depending on who we were playing. Coach Brown would give us some good speeches. They would definitely motivate us to grow from boys to men. I can’t recall any certain speech, but it was about the opportunities we were given: some might see them again and some might not, so we had to play the game like it was our last. Sometimes Coach Brown would get so deep and motivate you and you’d be so anxious that you’d get teary-eyed. Q: Did you read Coach Brown’s first book? CD: I remember that book. Q: We used to pass it among the younger strength staff. 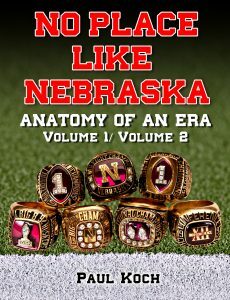 For a time there it was a dare to read that first chapter about the late offensive line recruit Victor Stachmus out of Oklahoma, who died of leukemia before he ever set foot on campus. The challenge was to read that first chapter and not cry. CD: Coach Brown could bring it out of you, man. He could bring you to tears. To this day, Coach Brown made me a different person. I reached out to him again when he first joined the staff again. I saw him when they were on the road to Baylor and the Cotton Bowl, and I’m gonna make a trip back to see the stadium again soon. Q: How often were your parents able to see you play at Nebraska? CD: My mom, I don’t think she missed a single game. They drove up a lot. My family would come up as much as they could. The sad thing? My last home game against Oklahoma it was iced over so she wasn’t able to drive up. My mom cried and I was sad about it, but she was able to watch me on TV. Q: What was it like shaking Coach Osborne’s hand and running out of the tunnel for that last time? CD: It had a little bit of everything. Just being your last game with T.O. and the last home game was a sad moment. You wished you could wind the tape back and give yourself another two years. It was a happy/sad moment. You were excited because we were getting ready to play Oklahoma, but at the same time you were saying, ‘This is it!’ You’d get teary eyed, but it was exciting. Q: What do you value most from your experience as a Nebraska student-athlete? CD: I think just being able to live up to your expectations as a man. Being there, you had people that had certain expectations of you that you had to honor within yourself and not be selfish. You had to carry the weight of saying, ‘I’ve got to play for me, but then I still have to deliver a lot to satisfy the team.’ You had to take those things into consideration and become humble. It wasn’t just about Corey Dixon, it was about doing it for the rest of these guys. It’s like when you do something wonderful and you do something great, you dedicate those moments to your teammates. You learned to share a lot with those who are on the battleground with you. That created a bond because you know what those guys have gone through. That’s what you miss, playing with those guys. Q: Any comments about some of the walk-ons who hardly ever got on the field? CD: I can’t recall the names at this particular time, but I tell you, it’s amazing to see that as a senior: these guys are walking on and they’re scout team guys… and then two years later you see them being starters. That’s amazing to me. It just takes hard work and dedication. All of a sudden it’s two years later and I’m watching Nebraska on TV and they’re starters. I remember one guy I know who honored his assignment, and that was Lance Gray. Lance was known to be the wedge-buster. For him to go down on the kickoff and bust a wedge like he would, that’s amazing. Because those guys would literally get up and fall back down dizzy, probably from a concussion. (laughs) Lance had that down. He was something else. 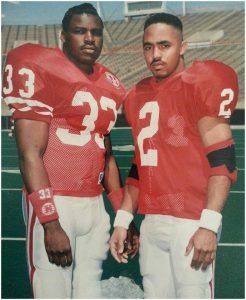 Coach Ron Brown didn’t respond to my requests for this project, as he just made the switch to running backs coach at the University of Nebraska at that time, having his hands more than full. ”He believed in you, he was honest with you, and he’d make you become a workaholic” was Corey’s summation of his coaching. Now, Ron wasn’t the prototypical ‘receivers’ coach’ you’d find in most college offenses or the professional ranks, but instead was something of a mini-offensive line coach, by all intents. Sure, his disciples caught a pass now and again, but it was their scrappy, dogged, punishing downfield blocking they were most known for. And when the ball was put to flight? The pressure was on. Because it was a rare occurrence compared to most, and not one to be taken lightly, “…it was about the opportunities we were given. Some might see them again and some might not, so we had to play the game like it was our last.” And if anyone could tug at your heartstrings, it was this man.” Sometimes Coach Brown would get so deep and motivate you and you’d be so anxious that you’d get teary-eyed.” Read his book, ‘I Can’ and have some tissues nearby, just in case. Maybe you’ve tired of the recurring ‘sour grapes’ refrain over the ’94 Florida State loss, but after all the time, all the energy, all the effort, the years of striving to finally hit the heights of an Orange Bowl victory, to see success literally snatched from those youngsters’ grasp by a bogus penalty makes my heart ache. To this day. Like the ’82 Penn State game’s officiating, perhaps it’s just a bitter pill I’ll never swallow, volleying back and forth in my mouth instead despite the distaste. Danny Nee once said in a basketball halftime speech, “Life is not easy and life is not fair. Once you accept these statements as truth, life becomes tolerable.” I agree with him and can tolerate the poor calls by fallible human beings, but that still doesn’t make the hurt go away for these guys.